The Global South voice is getting louder in Kiribati and Tuvalu and was heard in the 10 November event Our People, Our Land and Our Future where the Pacific Calling Partnership aimed to bring the views of people living in the islands and obtain responses from people they consider their main polluters. 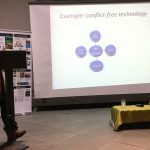 The event was held at the Interconnections Zone, a transdisciplinary space for dialogue on sustainable development and climate action hosted by the German Development Institute / Deutsches Institut für Entwicklungspolitik (DIE). 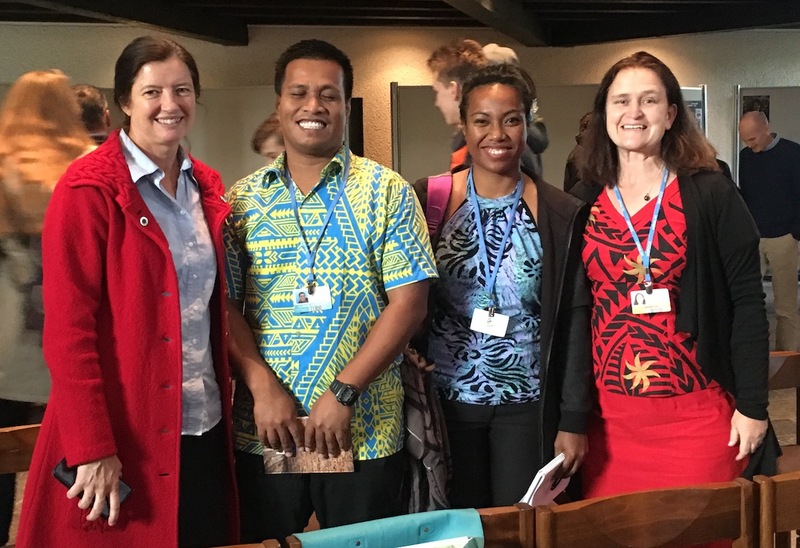 Representatives from the Pacific Calling Partnership joined the Ecojesuit COP23 side event 13 November at Aloisiuskolleg in Bonn, with Sue Martin at the left. 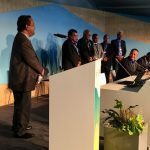 Prime Minister Enele Sopoaga of Tuvalu and former president of the Republic of Kiribati Anote Tong spoke on the work that is happening at COP23 and the UN to hear the voice of the low-lying island states and the metaphor of all needing to ‘paddle together’ was used to describe the future desired. Expressed during the event are statements that they are not leaving their islands and that a global temperature target of 2 degrees Celsius is not good enough. It was made clear that a sovereign state will exist no matter where the sea level moves. Migration is a major concern and it is a right of the people of Kiribati and Tuvalu but must involve a dignified process. There is a proposal going to the UN endorsing the Rights of People Displaced by Climate Change as they are not covered by the Rights of Refugees and Asylum Seekers. This is needed because climate-displaced people are not refugees. Displacement in the future should be a conversation that includes compensation from the global north who still resist taking responsibility for the consequences and impact of their economic development models to places like Kiribatu and Tuvalu. 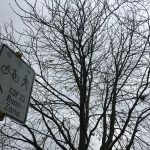 Forestry compensation is happening in the carbon capture projects occurring, but coral and ocean impacts are not yet considered in the COP23 negotiations for compensation. An inter-congregational voice on climate change, the Pacific Climate Watch, is also working with the Pacific Calling Partnership and has an Ecojesuit presence with Micronesia and Australian voices. The Society of Jesus is part of this growing voice with the Institute of Sisters of Mercy of Australia and Papua New Guinea, the Dominican Sisters of Eastern Australia and Solomon Islands, the Missionary Sisters of the Society of Mary, the Daughters of Our Lady of the Sacred Heart, Sisters of Saint Joseph, Marist Brothers, Franciscan Friars-Order of Friars Minor, Presentation Society of Australia and Papua New Guinea, Good Samaritan Sisters, Marist Sisters, Christian Brothers, Caritas Australia, Edmund Rice Center, and the Little Company of Mary. Paddling together, the canoe journey needs to have high ambitions. Anote Tong put forward the proposal to have a moratorium on new coal mines, but it was only met with mixed messages and disappointment as the Australian government supports the development of the Carmichael coal mine in the Galilee Basin by the Adani Enterprises. It is expected to be the largest coal mine in the world. Canada was able to shift its carbon policy 180 degrees, so it is possible for countries in the global north to shift as well, but needs honesty and trust in paddling together to save the islands and to save us. Sue Martin is the Sustainability Coordinator at Saint Ignatius Riverview in Sydney, Australian and joined the Ecojesuit team in Bonn.